Track made from scratch by Dave Ott. Some awesome side by side racing on this big, wide 1/2 semi banked clay oval. 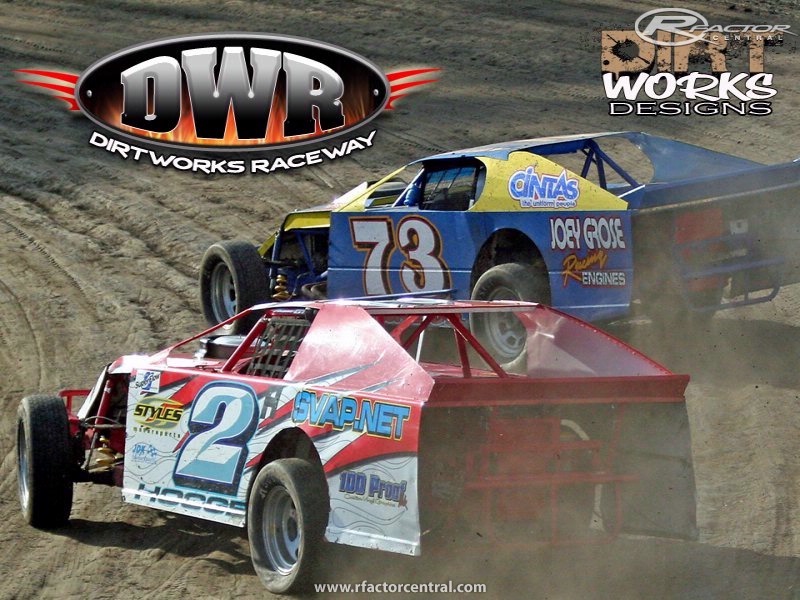 There are currently no setups for DirtWorks Raceway by DirtWorks Designs. Add a Setup. Dirt Works Tracks are by far the greatest tracks to race on. If you are thinking of some more tracks to do I would love to see Fairmont raceway out of Fairmont Mn. Its the fastest half mile high banked track in the Midwest! I have personally raced on it and the title holds true! Wouldn't mind seeing some tiny ones like Path Valley, Hill Valley, Cove View, and Hunterstown. Some Defunct ones like Dorsey and Windber. Cumberland, Roaring Knob, Lincoln, etc would be pretty cool, too. DWD tracks are the best to race on! I appreciate them very much. Are there anymore tracks in future plans? If you are taking requests I'd like to see some classics like Manzanita, Midwest, or Ascot. Some currents like Perris or the Devils Bowl. DWD tracks are the best to race on! !